See below details for a rfactor2 mini series we are planning to run starting with a test races tomorrow evening Sunday 8 Dec on Essington. The MOD we are going to use is the Historic F3's. Date: Sunday 08 December (3 * 15 minute races) - This is for test purposes mainly for the server etc.. If any driver wishes to start at the back of the grid for the 2nd race, then please say in warmup straight away. Most of us have tried the reverse grids before and know what to expect, and if admin feel the procedure is not working, a short super pole quali session will be implemented for the 2nd race. Admin - please feel free to add or change anything from this post! Please sign into this thread, if you wish to take part! Looks like for the first 2 races, the link to the track isn't formatted correctly. Do we have a server up running Mid Ohio yet? 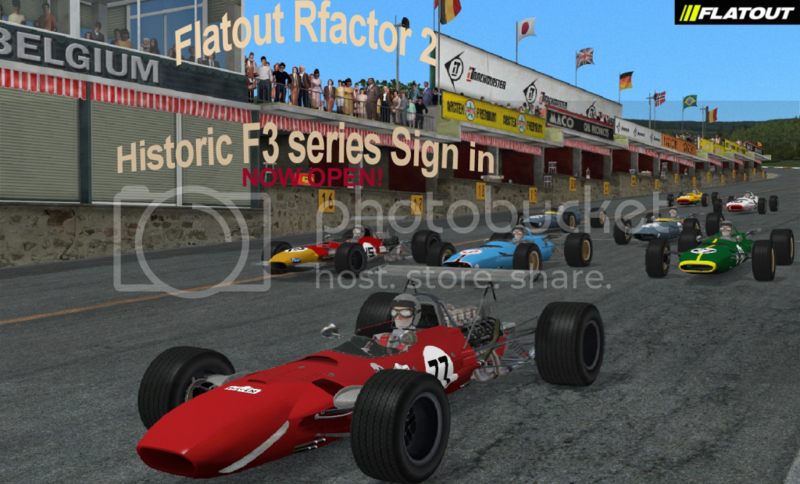 Flatout server is now running Mid Ohio. I will be up for this. is there anyway to get the lap times and server info onto front page like rf1? Thx to Bevan : Laptimes should be up, but not tested yet. server info, Bev is looking into. The pluging from rF1 doesn't work on rF2 . I'll be getting back in to racing in the new year. So sign me up for some of the later events. The decision to change to "Black hole ring" and "Topeka" has been made and is now confirmed. The reason for the change, was that following test races we felt Spa was just too long in it's historic layout for our current series format, mess up a hot lap and before you know it, it's 15 minutes into quali still with no time on the board and Monaco although wonderful in every way, we felt would lead to an early bath for someone for sure and we would like the series to be as positive and enjoyable for all as possible. There is no doubt that both of these tracks will play a part in Flatout RF2 racing but more than likely in a special event, perhaps an endurance style race with a different format sometime in the future. For any driver particularly looking forward to either of these tracks we apologize and hope you understand the reasoning behind the decision. More than 10 tracks were tested for suitability as replacements, the tracks selected work really well and have a little of everything included and there is no doubt that they will prove to be the perfect stomping ground for these Historic F3 beasties ! I have mentioned to Steve, the site owner of http://www.Racing-Leagues.com that any interested drivers would be welcome to join us and take part in the upcoming F3 series. Racing-Leagues.com are also planning an RF2 V8 series with testing this Saturday and planned series tbc but looking like Saturday mornings in the near future. I have been on track and on TS with Steve, he is a top bloke and would undoubtedly find the series exciting and would help encourage others to take part. The site has recently been renewed and as such has only a few active members but with over 12 years of on-line racing history, there are many registered members, hopefully interest would spread if given the opportunity. I will be taking part in the V8 series that Racing-leagues host and it would be good to see a few fellow Flatout members giving it a go too. I hope you will join me in welcoming any racing-league drivers that get involved and here's hoping both clubs can help increase activity through our continued open community approach.